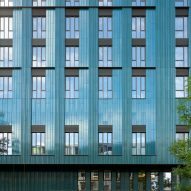 Metropolitan Workshop's tower of small modular homes in London is covered in a "chameleon-style" facade of glazed terracotta that changes colour in the different light conditions. 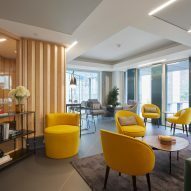 The London-based architecture studio designed Mapleton Crescent in Wandsworth, a 27-storey tower on a small plot of land, for specialist tiny home developer Pocket Living. 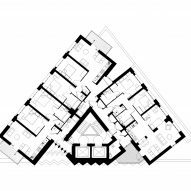 A constrained triangular site of just 476-square-metres and the requirement to use one of Pocket Living's pre-designed housing module plans, meant the architecture studio needed to get creative with how the tower looked. "Most people have got pre-conceived ideas about what modular constructed buildings can look like," Tom Mitchell, Metropolitan Workshop associate director, told Dezeen. 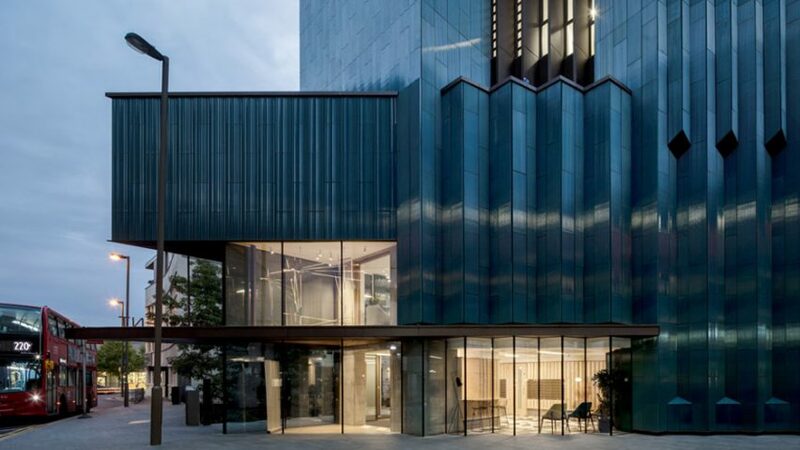 "What we think is really unique about this project – quite apart from the fact it's a really beautiful building with the turquoise glazed terracotta and unusual geometries – is the fact that it really challenges what a steel-framed modular structure can be." The prefabricated modules were made offsite then craned into position around the steel frame. Instead of traditional brick, Metropolitan Workshop chose a facade could be both practical – the terracotta tiles are self cleaning – and reflected the natural surrounds of the River Wandle. Loraine Rutt, a ceramicist and artist with connections to the area of Wandsworth, created the teal-coloured tiles with ridges and pleats. The green-blue is supposed to echo the colour of the river and the plants that grow in it. "One remarkable aspect of this material is its ever-changing appearance. You go to the site in different weather conditions and the building looks completely different," Mitchel said. "It's got a chameleon-style quality." Viewed from the south, with sunlight hitting the facade, the tower appears to be the colour of patinanted copper, but from the north it looks more teal-coloured. 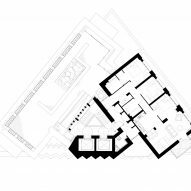 Two wings of modular apartments, each a 6.2 metre by 6.2 metre square, form two sides of the tower, with the steel frame stair and lift core on the third side, which has an unusual sawtooth-profiled facade. 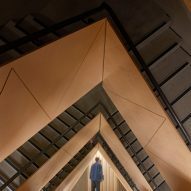 "We thought it would be a nice idea if we took the geometries of the two Pocket wings and folded them along that third side, rather than take it across flat, to create something really unique and distinctive," said Mitchell. 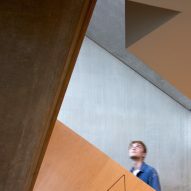 Three types of facade panel were designed to give texture and depth to the three-sided tower. Pocket Living develops small homes for people who live locally to their sites around London. Its one-bedroom homes, including the ones in Mapleton Crescent, are 38 square metres. As they have a larger footprint than the UK's minimum standard they aren't classed as micro-homes. Of the 89 homes in Mapleton Crescent, sixty per cent of the homes are deemed affordable and are available for local buyers. Pocket Living owners can only sell on their homes at the same 20 per cent discount that was applied when they bought it. The developers have also converted a disused office block in Wandsworth into 45 small homes. 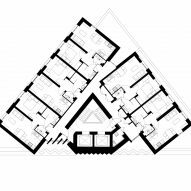 Metropolitan Workshop are one of the architecture studios working on the redevelopment of Robin Hood gardens. Photography is by Simon Kennedy, except where stated.